Basic Kit with an 8mm tube to make the lower unit. Solid center band . Traditional clip style and a recess in the cap for inlay of a piece of pen material. 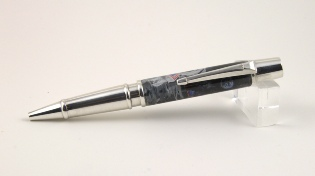 This style is ithe pen pictured above. Solid Silver lower unit , clip and recessed cap. You may choose a clip style to suit your needs. 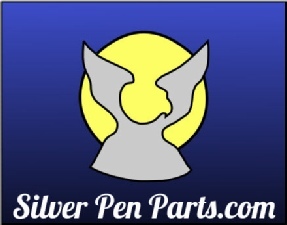 You can choose between 3 solid silver styles, smooth, fluted, as above, or fluted like lower left. Click pen with 8mm tube for lower unit. A solid smooth nose cone, the fluted style like above or the stepped style like to the left..